Asked whether investors would contemplate leaving Vietnam’s wind sector, Morten Dyholm, vice president of Vestas Group, stated that investors see great potential, huge demand, and strong political commitment here. Wind power is one of the most competitive energy sources globally and one of the fastest-growing industries in the world. “Thus, global firms will not leave this market,” he said, adding that a series of petitions have already been submitted. Having co-operated with many investors, Duong Tan Long, head of the Energy and Electricity at the Binh Thuan Department of Industry and Trade, said that foreign investors are still waiting for feed-in-tariff (FiT) adjustments as well as policy changes in the near future. While Vietnam boasts a solid national energy policy and has set realistic targets, work still needs to be done to improve the effectiveness and transparency of the market rules as well as the procurement process. According to the Global Wind Energy Council, the country needs to untangle the knots step by step in order for the wind power sector in Vietnam to take off, providing major economic and environmental benefits as well as making Vietnam an attractive investment destination for international investors. Bui Vinh Thang, business development manager of major global renewable developer Mainstream Renewable Power, told VIR at Vietnam’s recent first wind power conference that Mainstream is expected to start construction on its wind power project in the southern province of Soc Trang in 2019. Last year, Mainstream set a target to build and operate three wind power projects with a combined capacity of approximately 940 megawatts (MW) in Vietnam, in partnership with local and international developers. 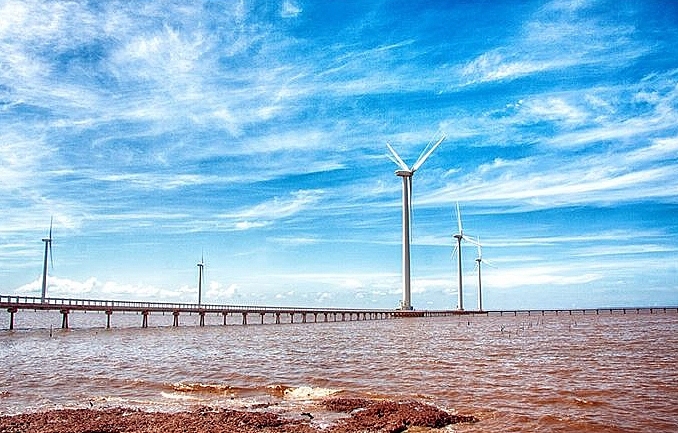 Under their memorandum of understanding, Mainstream and GE Energy Financial Services will invest around USD2 billion in the construction of the 800MW Phu Cuong wind power project in Soc Trang, developed in co-operation with local partner Phu Cuong Group, which will remain involved in the project throughout its five development phases. The first phase, slated to produce 150-200MW, is expected to conclude its financing by the end of the year. However, Thang said that without a bankable power purchase agreement (PPA), the project would not be able to keep on track. Oliver Duguet, CEO of The Blue Circle, which is developing the Dam Nai wind power project, one of seven wind power projects in Vietnam that have started construction, previously told VIR that, as the availability of long-term project debt financing is the key to wind power projects being built in Vietnam, at least 2,000MW would become financially viable through a PPA indexation, contributing to Vietnam’s energy independence as well as to the long-term national target of 6,000MW of wind power being installed by 2030. Duguet stressed that The Blue Circle is ready and committed to playing a major role in Vietnam’s future growth in wind power. The power purchase agreement (PPA) is the most important element in determining the cost of financing a power project. A standardised, transparent, and bankable PPA is essential for reducing risks and lowering the cost of capital. We are pleased to see that PPAs have been signed for recent wind projects, but further refinement would be needed for them to be ‘bankable’ for international investors and to match the wind generation capacity in Vietnam with the increase in electricity demand. A clear, transparent, and timely project approval process is critical to reduce uncertainty, foster market and investor confidence, and maximise the sector’s growth. With the foreseen spectacular growth in the power sector, planning and investment will be needed to ensure the successful integration of various renewable energies such as wind and solar. A strong national industry needs a strong industry association to support its development. An industry association is indispensable for the healthy development of the wind industry, as has been seen in leading wind power countries like China, the US, Germany, Denmark, India, Spain, Brazil, the UK, France, and Mexico. A national wind energy association can be a key driver for legislative initiatives and can help the government to support the industry, while fostering a direct dialogue for public-private partnerships, which may lay the foundation to align capabilities from each side. It can help the government in communicating with the industry efficiently and effectively and act as a focal point for the industry to interact with the government. It can also help to build the industry by creating industry conferences, workshops, and other training and educational programmes.